Currently Available on: Second-hand: eBay, etc, Abandonware sites. In the here and now, in 2013, Football Manager is the undisputed king of the sports management genre. Many have tried to topple it, but all have failed. Sports Interactive have built a legacy of high-quality, engrossing games. Studio chairs, and brothers, Paul and Oliver Collyer are certainly two of the biggest names in the UK games industry. Although in the early 2000’s the the team lost the rights to the Championship Manager name that they created when they split from Eidos, their titles remain the preferred choice of the serious football fan. However, wind back in time twenty years, and the two were your typical British bedroom programmers, and the rather basic first Championship Manager game launched at retail to a muted response. It didn’t feature real teams, and was written in the famous BASIC programming language, so it definitely wasn’t a looker. Fans and critics alike weren’t exceedingly taken with the title, but it began to build a cult following, among those who wanted a more serious alternative to the then-current crop of management sims. 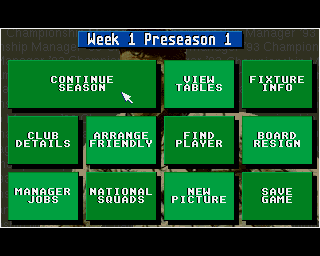 It wasn’t until the following years’ effort, Championship Manager ’93, that the franchise really started to build up some steam and began its journey to becoming the only serious option for those who prefer to wear sheepskin jackets, or the latest budding Alf Ramsey. The game was given a huge overhaul, and its engine was made much more complex and powerful, offering a deep and complete simulation, but most importantly, the game now featured complete real teams and players from all tiers of the English football league. You could now take your favourite third division minnows and and lead them to Premier League glory; with a lot of work and a little time. The game may not have featured all of the complexities that later games such as Championship Manager 2 did, and nothing like the all-encompassing features seen in the modern Football Manager games, but the first few Championship Manager games were revolutionary at the time. Players would, of course, begin by creating a manager name and their characteristics – confident, arrogant, responsible – all of which would influence how players perceive you, how you are able to motivate them and how happy they will remain with you as the season progresses. Then of course, like any management sim, you will pick your team and start assembling a squad that will be able to take on all comers. Obviously choosing tactics and formations form the bulk of this, but a few other extra features were added in such as the ability to set win bonuses and goal scoring bonuses, as an extra motivation. All players are given a series of fifteen or so different skills – such as speed, passing, tackling, etc – and these are each marked out of twenty, so the manager can quickly asses who will play best in which position, who should take free kicks and corners, and who might make a good leader as team captain. Find the best system that suits your team and players, and you won’t be far from success. As this was back in the day, you even had to worry about having too many non-English players in your squad, and manage keeping them all happy whilst only being able to name three in a match-day team. The big innovation that came with the Championship Manager series was the Average Rating system. Much in the same way as the old weekly football magazines such as Shoot or Match, every player is given a mark out of ten after each match, depending on their performance. This is then carried over between each game and an average tracked over the whole of a season. This provided players with an instant way to gauge how players were developing and whether they were consistent or just a hot and cold player. You could also track stats such as goals scored and assists provided, so you could make informed decisions of who could be a game changer, and perhaps who needs to be dropped. Just like a real manager, sometimes you would have to bring down the hammer on a big name player if they weren’t performing. The other real strong point of the game was the relationship that you could develop with players. Have some success and treat a player positively – playing them often, for example – and players will gain confidence in you, but don’t play a certain footballer regularly, or at least not as often as they would like, and they will soon become unhappy with you. You can rectify it by putting them back in the team, but sometimes they will be too unhappy and simply refuse to play or request a move. Get some good results, such as a promotion or cup win, and the player may even come back to you, saying they have changed their mind and want to stay. Fines are another issue, say your goalkeeper is sent off for fighting in a match, you can fine him, and he may accept it, no questions asked, but he might feel you are wrong, and you will see a message such as “he thinks that is not fair”, and become very unhappy. You could always offer him a new contract to beg him to stay, but some players will be so temperamental – again shown by their ratings – and will be hard to please. In that sense, the game is very much about people management, and that includes injuries. Losing a star player for the whole season could be disastrous, but you could insure them so that you get a nice windfall that could be used to find a stand-in, should the worst occur. The transfer system was very deep, with players needing to recruit scouts who could search different leagues and watch certain players to judge if they would be good investments, but do you take a chance and find a cheap scout who is out of contract, or try to steal one from another team; no doubt having to pay a premium, but getting someone with a proven record. Salary negotiations could be tense, having to balance your board’s money concerns and the demands of the player, and you would only have a certain number of attempts to reach a conclusion before you put off the player and they decided he didn’t want to make a deal with you; or the board decided you couldn’t spend that much on them. The board will often chime in with nuggets of advice or wisdom, and if you don’t pay heed, you might find yourself out of a job. This could be incredibly frustrating, but made the game much more realistic. The way matches were presented in-game is perhaps the most iconic thing about Championship Manager though. The in-match engine is very simple, and you only see a possession meter – no other graphics – but it is the detailed text commentary that captured the hearts of players. Relayed on-screen in small chunks, the text would create real tension as messages such as “that’s a bad tackle” would appear, you would wait a few seconds as the game processes then “the referee pulls out a card”, wait again, “it’s red!” The delays between lines would keep you waiting and hooked to see what happened next, sometimes fooling you, by saying a goal had been scored, only to say after that it had been disallowed. There were no images or moving players to watch, but the excitement and nervousness was perhaps even greater, as you had to wait and see; at least until half time when you could see some average ratings to determine what changes you could make. The lack of any sound at all perhaps made it even more tense, as you were solely occupied with the match, nothing else. For these reasons, the game was much deeper than any other management sim we had ever seen before at the time. Sure, you could offer bungs and bet on matches in Premier Manager, or you could build a new stadium, stand by stand, burger cart by burger cart in Ultimate Soccer Manager, but no other game made your players, board and staff feel like real people quite like Championship Manager. There were so many man-management factors to take into account, that by having a successful team and players who enjoyed playing for you, it felt like a real achievement. Even more so if you managed to snag a cup or league trophy. The game has developed wildly over the years, but the basis remains the same as ever, and the famous text commentary is still in place; if you choose to watch it. 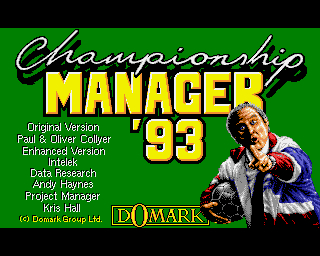 However, I still think back to the simpler pleasures of the early games, and perhaps Sports Interactive see that – due to the addition of a simplified “classic” mode for Football Manager 2013 – but it remains to be seen if it can capture my heart and my imagination in the same way that Championship Manager ’93 did. 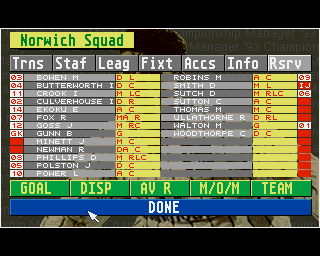 Championship Manager ’93 is now available for free download as abandonware. You can also find this game on Second-hand sites such as eBay. Football Manager 2013 is released today for Windows PC and Mac. 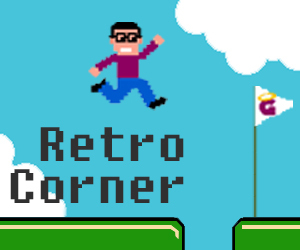 See previous entries into the GodisaGeek Retro Corner by clicking here.